View Glenelg River Basin in a larger map (opens new window). 1 ha. Family Fishing Lake. Not shown on map. Located in Coleraine near the old railway station. Managed as a Family Fishing Lake and stocked with advanced yearling rainbow (See Introduction). Flows through forest and farmland, mud substrate. No vehicle access to the headwaters. A barrier to fish movement has been removed as part of the River Health Program. Contains mainly redfin av. 220 g, (max. 1.6 kg), river blackfish, short-finned eel, congoli, very occasional brown trout, southern pygmy perch, mountain galaxias, common galaxias, abundant Glenelg spiny crayfish, tench, Ewens pygmy perch and Yarra pygmy perch. 1 ha. Family Fishing Lake. Located on Salt Creek on the NE fringe of Dunkeld. Managed as a Family Fishing Lake and stocked with advanced yearling rainbow trout (See Introduction). Located at the northern edge of Casterton. The water is subject to wide fluctuations in level and high summer water temperatures. Naturally carries goldfish to 400 g, redfin to 850 g and tench to 1 kg. Managed as a Family Fishing Lake and stocked with advanced yearling rainbow (See Introduction). A rock-ramp fishway has been constructed at the Dartmooor flow gauge. Unfortunately the effects of the sediment accumulated in the Glenelg River will persist for many years with much of the river shallow and relatively unproductive in spite of sediment being actively removed from thirteen sites as part of the River Health program. This has also seen large logs installed instream over 5 km of river to improve fish habitat and substantial planting and protection of native vegetation on the banks. Flow downstream of Rocklands Reservoir is highly regulated. This results in very low flows with parts of the river drying-up completely during summer and high water temperatures throughout the river. Water temperatures as high as 310 C have been recorded during surveys. In the upper section, (around Harrow) the new reduced flows have resulted in a new and smaller channel cut into the bed of the wider original channel. Vegetation such as canegrass encroaches into the old channel. Salinity is increasing. Stocking a range of native and introduced species in the past has not produced worthwhile results. A number of smaller tributaries flow in low forest and farmland (See Grampian National Park Streams). The main channel contains river blackfish, mountain galaxias, southern pygmy perch, eastern dwarf galaxias, eastern gambusia, redfin, goldfish and tench. Flows through forest with red gum riparian vegetation, mud and rock bottom. The section between Rocklands Reservoir and Fulham Bridge has extensive elongated pools up to 8.5 m deep separated by shallow sections less than 3 m deep and is a popular fishing area. Contains mostly redfin to 1.5 kg but the average size is much smaller, some brown trout to 1.5 kg, river blackfish, short-finned eel, Yarra pygmy perch, mountain galaxias, flathead gudgeon, goldfish, eastern gambusia, European carp and eastern dwarf galaxias. In the late 1990's, Australian bass were illegally stocked below the dam wall. Small numbers are still being caught. The Catchment Management Authority has modified the outlet from Rocklands Reservoir to allow increased water release down river. New screens have also been installed to prevent the downstream movement of European carp or European carp eggs. Flows on the edge of often steep forest, or through rolling farmland. Almost the entire length has good riparian vegetation of mature red gums. Substrate is predominantly sand. River width varies from 6-21 m. Much of the river has shallow riffles more than 50 cm deep, or narrow deeper channels flowing through canegrass, or around instream islands. These shallow reaches separate extensive pools 1-4 m deep. Access is restricted as the river often flows a considerable distance and out of sight of the road. There are only a few public access points from the road, such as at Bourke's Bridge on the Casterton/Edenhope Road, downstream from Mooree, or at Harrow. There is good access to the river at Bourke's Bridge and camping sites although there are no facilities. Here the river has extensive pools and good riparian vegetation of tea-tree and eucalypts and a sand substrate. Further downstream at Harrow, the river is quite small (less than 10 m wide) and has shallow riffles 30 cm deep. However there are deeper gutters and pools with sand substrate that provide some angling for redfin, and river blackfish. Access elsewhere requires passage through private property. Contains a few brown trout av. 220 g, (max. 1.1 kg), redfin av. 230 g, (max. 1 kg), short-finned eel, river blackfish, congoli, Yarra pygmy perch, common galaxias and flathead gudgeon. There are some European carp in the Harrow area. The river flows through flat farmland then forested hills nearer to Casterton. There is good riparian vegetation of mature eucalypts. At Casterton, the river is 5-8 m wide with an average depth of 50-80 cm and gutters and pools 150 cm deep. Substrate is sand. There is some fish habitat in the deeper water. River width varies at other locations from 4-40 m with large areas of shallow riffle 10-30 cm deep and some deeper gutters and pools up to 400 cm. The substrate is all sand and there is considerable sedimentation which has filled many pools. The river is accessible upstream from Casterton for about 22 km via several side roads before moving some distance from the Casterton-Naracoorte Road. The same species present in the upstream section (Dergholm to Balmoral) also occur in this section. The river is easily reached at several locations, with the main target species being short-finned eel, redfin and river blackfish. Flows through forest and grazing land, sand bottom. There are extensive shallow sections but still some pools to 5 m deep. Accessible from a number of tracks or through private property, please ask permission. Angling species are a few brown trout and rainbow trout from small self-supporting populations near Casterton, some redfin to 450 g, short-finned eel and perhaps river blackfish. Contains the same species as upstream. Golden perch were stocked at Casterton in 1982-85. A popular recreational fishing location. Estuarine water extends up the river for about 60 km, with most of it within the Lower Glenelg National Park. It is a wide (50+ m) river with dramatic cliffs along its lower reaches and forest along much of its bank. The entrance is always open to the sea with a deep-water channel, resulting in constant movement of fish between the sea and the estuary. It is very suitable for boating with 29 landing areas along the river and numerous boat launching sites, however beware of snags between Fort O'Hare and Pines Landing in the upper reaches. Most landing areas have BBQ and picnic facilities. The river/estuary is also accessible from tracks within the park and there are numerous camping areas. One of the best is at Batterbys (check with Parks Victoria Office at Nelson to book a camp site). The south-west walking track follows alongside the last 40 km of river. Boats can be hired at Nelson and launched at Nelson, Donovans Landing, Sandy Waterholes, Sapling Creek and Pritchards and the estuary provides year round fishing. Part of the river flows in South Australia and in that section South Australian boating regulations apply. Victorian fishing regulations apply to the entire river with the exception that a Recreational Fishing Licence is not required in the South Australian section. Water skiing is permitted and occurs at the end of North Nelson Road and just upstream of Nelson in Taylors Straight. Twenty five estuarine species have been recorded in the estuary but the most common are black bream to 900 g, yellow eye mullet, Australian salmon, estuary perch, mulloway to 7 kg with occasional larger fish, luderick, flathead and flounder. Baits recommended are sandworms, whitebait, shrimps, crabs and clickers. Large numbers of undersized black bream are often present. Keep trying different fishing locations to find larger fish. Spawning success of black bream in this estuary is often affected by low flow down the Glenelg River in drier years. This prevents the appropriate salinity levels required for bream spawning being achieved (see 'Saline Wedges in Estuaries'). The Department of Primary Industries has surveyed a number of the small tributaries of Tea Tree Creek and Scott Creek which drain the western side of the Victoria Ranges in the Grampians National Park and flow into Rocklands Reservoir. These include Hutt Creek, Deep Creek, Honeysuckle Creek, Graham Creek, Mosquito Creek, Camp Creek No 1, No 2 and No 3 Creeks. Tributaries of Little Tea Tree Creek (Gap Creek, Alex Creek, Headworks Creek and Browns Creek) which drains into the upper Wannon River, have also been surveyed. Water is diverted from some of these creeks to Hamilton. Stream width varies from an average of 2.1 m during high flow periods to less than 1.2 m during summer. Most creeks are less than 20-67 cm deep and seldom more than 90 cm. Substrate is usually sand. The streams contain Australian smelt, common galaxias, mountain galaxias, eastern dwarf galaxias, eastern gambusia, redfin, southern pygmy perch, river blackfish, western European carp gudgeon, flathead gudgeon, and northern burrowing cray, Engaeus lyelli, western cray, Geocherax falcata, and swamp cray, Gramastacus insolitus, as well as freshwater shrimp, Paratya australiensis. The main features of the fish populations are the abundance of mountain galaxias, the scarcity of exotic species and the small number of species in each water (varies from 0-5 species with an average of 2). Angling is not recommended. Small creek (<3 m wide) flowing through grazing country. Mud bottom upstream, gravel and rock downstream. Series of small pools separated by narrow riffles, vegetation in the channel. Contains mostly redfin to 700 g, goldfish to 1.3 kg, short-finned eel and occasionally brown trout and rainbow trout which escape from Lake Hamilton. Wetlands are being used to improve the water quality of storm run-off from Hamilton. A small fire-fighting supply dam beside the Mount-Gambier-Heywood Road, accessible by a road west of Greenwald. Stocked with rainbow trout in the early 90's but discontinued due to lack of results. No information on fish present. A man-made lake with sometimes turbid water, located within the City of Hamilton on the Grange Burn. Popular with anglers. Contains brown trout, rainbow trout, tench and redfin. The lake is stocked annually with brown trout and rainbow trout. Stocked with golden perch in 1983-88. Poor returns to anglers although fish grew to weights in excess of 5kg. In 1999 the lake also received a trial stocking of estuary perch fingerlings. Tributary of Crawford River flowing through farmland, mud and gravel substrate. Contains some brown trout, abundant small river blackfish, short-finned eel, mountain galaxias, southern pygmy perch and some redfin to 220 g.
Domestic water supply for Coleraine and Casterton. Surrounded by farmland and pine plantations, extensive weed beds. Best access via Reservoir Road off the Coleraine-Harrow Road. Contains brown trout average 1 kg, maximum 2 kg, rainbow trout, redfin to 1.6 kg, (av. 460 g), goldfish to 1.6 kg, tench to 1.5 kg and common galaxias. Stocked regularly with brown trout and rainbow trout. Non-power boating permitted. A shallow brackish lake surrounded by grazing land. Carries only short-finned eel, some redfin and eastern dwarf galaxias. 10 ha. Also called Bong Bong Lake, Bung Bung Lake and Moniebeong Lake. A very clear spring-fed lake situated behind coastal sand dunes in the Discovery Bay Coastal Park, sand bottom. Surrounded by grazing land, scrub and pine plantations. Can be reached by a track off the Portland-Nelson Road near the 54 km post. Non-power boating permitted. Carries river blackfish, short-finned eel, Australian smelt, common galaxias, flathead gudgeon, southern pygmy perch, bluespot goby and smallmouth hardyhead. Tributary of Grange Burn flowing through farmland, rock and mud bottom. Access is through private property. Contains brown trout to 600 g, river blackfish, southern pygmy perch, common galaxias and short-finned eel. Not shown on the map but located in Hamilton in a residential area. Deep water and open to bank fishing only. Contains predominantly redfin to 1 kg and tench to 2.7 kg. 6,750 ha. 348,000 ML. Numerous camping sites and 3 boat ramps. A large irrigation storage surrounded by forest. Camping facilities at the wall and some dry weather roads around the lake. Contains abundant redfin to 2 kg, with most fish 450-770 g, brown trout to 1.6 kg, av. about 1 kg, tench to 1.5 kg, goldfish to 800 g and some river blackfish. 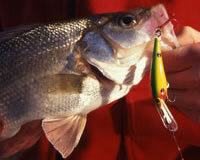 Redfin is the predominant target species and fishing is best around submerged timber when the lake is near full. Trout are stocked occasionally. European carp were detected in the reservoir in 2000. Rocklands Reservoir received significant inflows following the abundant rain in 2010. As a result the reservoir was stocked with 10,000 rainbow trout in November 2010, in addition to 5,000 rainbow trout that were stocked in July 2010. A very narrow river flowing through forested country, mud and gravel bottom. Surrounded by private property and access is not encouraged. A barrier to fish movement has been removed as part of the River Health Program. Carries short-finned eel, tench, river blackfish, congoli, Australian smelt, Ewens pygmy perch, common galaxias, shorthead lamprey, spotted galaxias, spiny freshwater crayfish and occasional brown trout to 700 g.
2 ha. Also called Freshwater Lake. Not shown on map. A shallow lake which frequently goes dry, mud substrate. Surrounded by bracken and grazing land. Carries redfin av. 220 g, max. 900 g. Bank fishing is difficult because of prolific weed growth. Rises near Dunkeld and flows 60 km to Nigretta Falls. Areas of low forest and heathland scrub near Dunkeld but flows mostly through farmland. Access from several cross roads. The river at Cavendish has extensive reaches of deep water (4-6 m). Upstream the river is shallower and becomes quite low or dries up into a number of discrete pools, during summer. Contains redfin to 450 g, some brown trout to 900 g. small river blackfish, eastern dwarf galaxias, mountain galaxias and southern pygmy perch. Wannon and Nigretta Falls prevent the upstream movement of migratory species. This 8 km stretch of river flows through a steep valley at Nigretta Falls then through moderate/flat farmland to the Wannon Falls located just downstream of the Glenelg Highway. Riparian vegetation is mature eucalypts, tea-tree and grass. River width is 12-15 m. Pools are mostly less than 100 cm deep with some deeper gutters present. During summer the riffles become very shallow with loss of wetted area. Substrate is rubble in the riffles and rubble, mud and rock in the pools. Debris, deep water and banks provide most fish cover. This is a productive water carrying abundant river blackfish, redfin, some brown trout, a pygmy perch, western carp gudgeon and reports of some Macquarie perch in past years. This section was stocked with this species between 1920 and 1929 and a remnant population was present as late as 1990 and may still persist. Access is possible at Nigretta Falls (where there is a picnic area with facilities) or by walking across private farmland from Nigretta Road. Caravan Park and picnic facilities at Wannon Falls. Flows for 60 km to the Glenelg River at Casterton, through moderately sloping then flat farmland. Has good riparian vegetation of mature eucalypts. Accessible mostly through private property. At the bridge on the Merino-Coleraine Road the river is 6-8 m wide with extensive pools over 3 m deep. There is abundant aquatic vegetation, a fringe of canegrass, sluggish flow and a mud substrate. There is good habitat present at this site. Further downstream nearer Casterton, it flows through flat farmland with riparian vegetation of eucalypts but has become badly silted with very shallow water and a sand bottom. Little habitat for larger-sized fish and angling in these lower reaches is not recommended. Contains occasional brown trout to 1.3 kg, redfin to 1 kg, short-finned eel, congoli, tench, river blackfish, Australian smelt, Yarra pygmy perch, southern pygmy perch, common galaxias, flathead gudgeon, and western carp gudgeon. The river downstream of Wannon Falls was stocked from 1913-1927 with estuary perch and in 1987-1990 with golden perch.